Ice Cream, Iced Cream, and Porcelain - Bardith, Ltd. When enjoying ice cream did you ever think about who invented it? Ice cream evolved from "iced cream," a European dessert dating to the late 17th and early 18th century. Iced cream would have been served from porcelain ice pails. During the hot summer months, in a time long before refrigerators and air conditioning, iced cream for dessert was a fabulous treat! While the precise origins of the dessert are unknown, the first recorded English use of the term "iced cream" was in 1671 when it appeared on a menu detailing what was served in a royal feast at Windsor Castle. In the 17th and 18th centuries, obtaining and preserving ice year-round was a huge undertaking. Ice was often obtained from icehouses, which were built deep in the ground near great estates. Because of the expense, iced food was typically enjoyed by the rich, who could afford to build icehouses and had servants or slaves who shaved the ice and prepared iced cream. Traditionally placed on the sideboard in the dining room, the base was filled with ice and salt, the liner filled with cream and occasionally cut fruit. Additional ice was placed on the high walled cover. The cream would freeze, and then at the end of the meal the Hostess would serve iced cream. Iced cream was made in porcelain iced cream pails. Porcelain was an ideal medium for such vessels, as its non-porous surface prevented the leakage of salt water into the ice(d) cream. Clignancourt Porcelain Ice Pails, late 18th c.
The design of the typical iced cream cooler allowed for ice to be stored both in the interior, below the liner that held the cream, and on the exterior, in the cavity of the steep-sided lid. At Bardith, we are always looking to acquire antique porcelain ice coolers. Below are some of the ice coolers we have had in our collection. 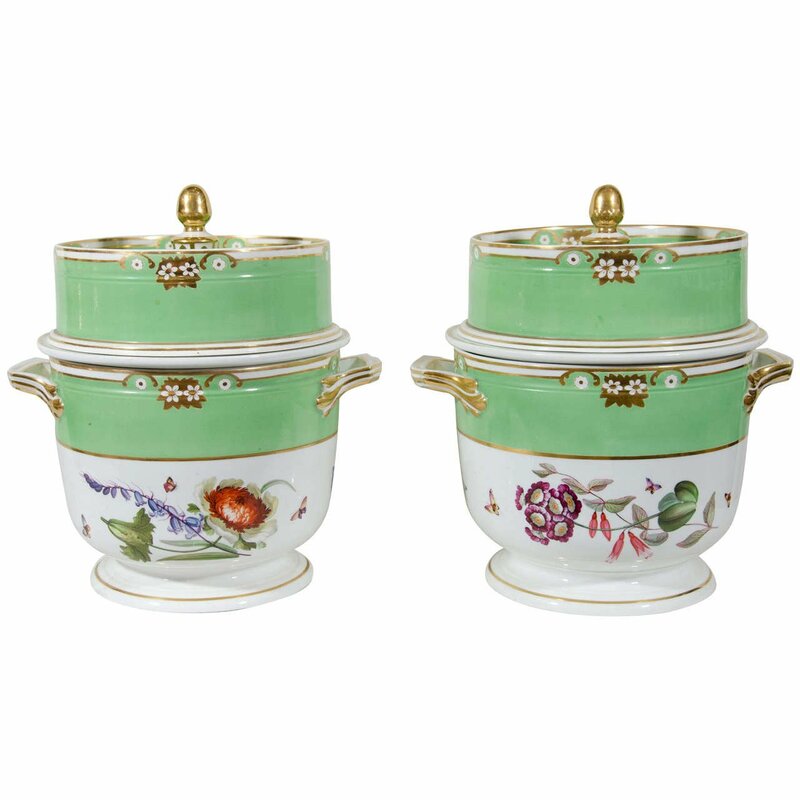 Coalport Ice Pail, 19th c.
Derby Apple Green Ice Pails, 19th c.
Flight Barr & Barr Worcester Porcelain Ice Pails, 19th c.
English Porcelain Ice Pails, early 19th c.
French Ice Pails, 18th c.
Yellow Coalport Ice Pails, early 19th c.
Avey, Tori. “Explore the Delicious History of Ice Cream.” The History Kitchen, PBS Food. 10 July 2012. “Celebrating July: Ice Cream Month.” The Oxford Companion to Food, Oxford University Press. 16 July, 2012. Munger, Jeffrey H. “Ice Cream Cooler.” Heilbrunn Timeline of Art History, the Metropolitan Museum of Art. Theobald, Mary Miley. “Some Cold, Hard Historical Facts about Good Old Ice Cream.” Colonial Williamsburg Journal, Winter 2010.